About Parker R. Smith, Esq. Parker Smith was born in Ringwood, Oklahoma on September 24, 1977. He is an attorney in good standing at the Oklahoma Bar Association, having been admitted in 2004. He attended Oklahoma State University where he majored in Economics with Quantitive Studies emphasis. He received his Bachelor of Science degree in May 2000. Mr. Smith attended the University of Oklahoma School of Law and received his Juris Doctor in December 2003. 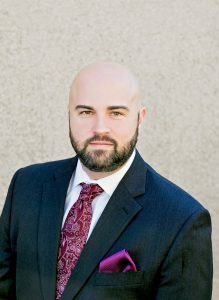 Prior to establishing his current practice in Tulsa, Oklahoma, Mr. Smith worked as an attorney for the law firm Mitchel, Gaston, Riffel & Riffel PLLC in Enid, Oklahoma and as a partner in the firm Smith & Grimes PC in Oklahoma City. Mr. Smith focuses his practice primarily on estate planning, business planning, probate and estate administration. He is experienced in planning and administering complex estates as well as litigation of contested estates. He works closely with the CPA’s at Preston Smith PLLC, Certified Public Accountants, in Tulsa, Oklahoma in devising estate and business counseling to provide the greatest possible results for his clients. Previously, Mr. Smith has practiced in the areas of family law, debt collection, bankruptcy, and civil litigation providing a broad background for his current estate planning and business planning law firm. Mr. Smith serves as a pro bono attorney for the Oklahoma Lawyers for Heroes progam which provides free legal assistance to qualified active duty and retired millitary veterans. Mr. Smith has also served as a pro bono attorney for Oklahoma Lawyers for Children, which supports children in the foster car system. Practice Areas: wills, trusts, power of attorney, living will, medicaid trust planning, probate, estates, asset protection planning, LLC, S-Corp, partnerships. Geographical Areas: Tulsa County, Oklahoma County, Rogers County, Wagoner County, Creek County, Okmulgee County, Osage County, Broken Arrow, Bixby, Owasso, Glenpool, Jenks, Skiatook. Mr. Smith focuses his practice primarily on estate planning, business planning, probate and estate administration. We work hand in hand with the income and estate tax experts at Preston Smith, PLLC Certified Public Accountants to provide the highest quality services and strategies.